Army ROTC is not all classroom and field training. There are many opportunities to get to know fellow cadets better and increase your skills in a variety of areas. Cadets voluntarily participate in these events; although some are popular enough, they compete just to get on the teams. Learn more about these events and activities below. It is a great honor for cadets to participate in the Color Guard, representing our nation’s Colors. 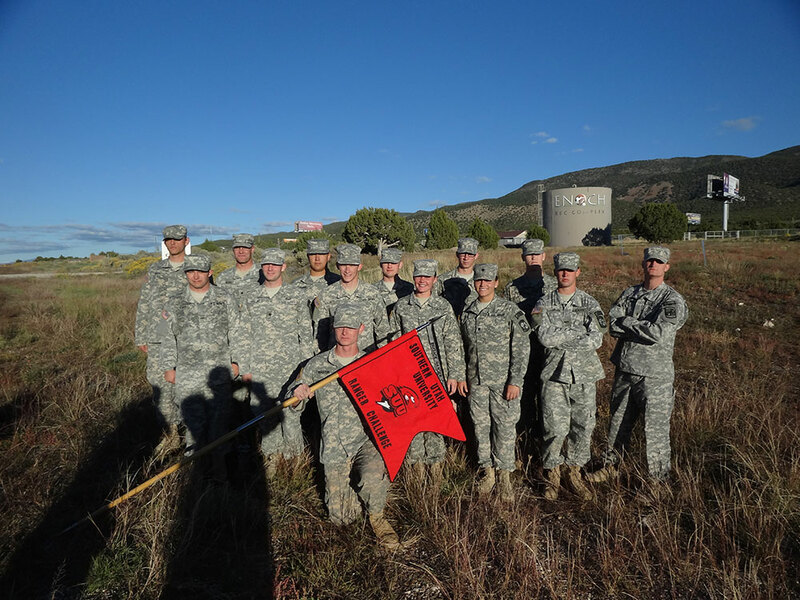 Members of the Color Guard presents the colors at campus social events, SUU Thunderbirds football and basketball games, military appreciation events, and community functions throughout the school year. This Military Formal is a chance for Cadets and Cadre to be recognized for their outstanding achievements. The formal consists of a guest speaker, dinner, awards ceremony, and a dance. This is also a great opportunity for the Cadets to introduce their friends and family to the Company. Every fall and spring the Thunderbird Company conducts a two-day Leader Development Exercise. Training starts on a Friday evening and is completed the following Saturday afternoon. When training with the entire battalion, "Cougar Battalion" conducts training at Camp Williams, Utah and gives cadets the opportunity to practice all the skills they have learned to date: they orienteer on the land navigation course, go through the Field Leader’s Reaction Course and the Confidence Course, apply adaptive leadership to complex situations and many other activities. The Bataan Memorial Death March is an event that commemorates the March of Death, WWII. American and Filipino Soldiers were surrendered to the Japanese forces. The Soldiers were forced to march 80 miles to a prison camp. During this time, Soldiers who fell behind or drew attention were bayonetted or beheaded. The 26.2 mile annual march honors the fallen. The march is attended by survivors of the March of Death to this day. Several ROTC program send cadets to participate in this march in order to remind them of the sacrifices that are made by Soldiers every day, and the dedication required by those who wish to lead them. Each Semester cadets participate in the CWST Lab. This includes a 25 meter continuous-swim, jumping from the high dive (3 meters) while blind folded with weapon in hand, swimming 15 meters in uniform while holding a weapon, jumping into the water and removing all gear while still submerged, and constructing a floatation device with the uniform pants. This is generally the most popular lab we hold each semester! The German Armed Forces Proficiency Badge is a foreign military award offered by the host country of Germany, made available to U.S. service members in 1972. The award is based on overall military performance and physical ability. The overall evaluation event is conducted with the assistance of a German Armed Forces Liaison, who ensures that all service members are performing the required tasks to standard. In order to qualify for the German Armed Forces Proficiency Badge service member must successfully complete several events. These events include a Combat Lifesaver evaluation, a Nuclear Biological Chemical protection proficiency evaluation, a 100 meter swim in military uniform, and a foot march with a 33lbs rucksack. Service Members must also complete a M9 pistol qualification table as well as a Basic Fitness Test that consists of a flex arm hang, 11 x 10 meter sprints, and a 1000 meter run. Once a service member has successfully completed these events he or she is awarded the badge in either gold, silver, or bronze depending on the amount of points earned in the pistol qualification and Basic Fitness Test. Service members who have earned the German Armed Forces Proficiency Badge are then authorized to proudly wear the badge on their Army Service Uniforms to display their military proficiency and physical ability.